For anyone afraid that We Can Be Heroes is ‘just for kids’- as I mistakenly thought as I accepted a copy from Egmont- don’t worry. We Can Be Heroes may be centred around Ben’s broken family, but Catherine Bruton has ensured that it has something in it for everyone, of any age. Parents will see their kids in the characters; grandparents their grandchildren. I saw myself and my friends when we were young and had over-active imaginations. Because that’s what We Can Be Heroes is all about- childhood dreaming. And anyone can relate to that. What surprised me about We Can Be Heroes is the sheer hilarity of it all, particularly the first half of the novel. Ben, Jed, and Priti’s crazy ideas serve for some amusement but the most comes from Priti, an over-intelligent 11-and-a-quarter year old who, in her own words, is helping Ben and Jed to “let go of their emotional baggage”. Her constant stream of intelligent babble had me smiling, in similar ways to the comic strip Calvin and Hobbes, except it’s less philosophical and more diagnostic. 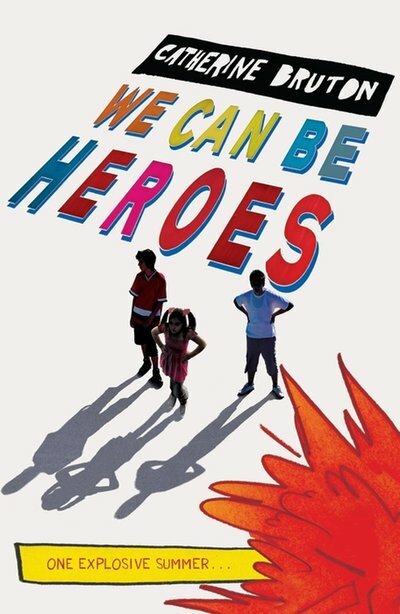 We Can Be Heroes may be aimed at the middle-grade market primarily, but Bruton has really done well with her characters. They are a surprisingly accurate representation of British domesticity- lead from the rear by the typical grandparents, who Bruton embodies extravagantly, particularly as the climax of the story unfolds. While the first half of the relatively chunky 400-odd We Can Be Heroes offers a comic relief, things get serious towards the end, coming to a competent yet predictable climax. But as with all novels like this, it’s more about the characters- as is confirmed by the blurb, which heavily suggests at least some of the outcomes of the happenings throughout. We Can Be Heroes is an unexpectedly good read- and one that offers both humour and seriousness. Catherine Bruton serves a perfect platter of British living. From the characters to the setting, We Can Be Heroes will ring a bell for any Brit (and if you’re American, then your education begins now!) This wonderful novel tells about the imagination of kids, of consequence, and of parents, who are often a lot less mature than their children. If you’re a parent, you’ll love this, and if you’re not, you’ll love it anyway. What did you think about We Can Be Heroes?